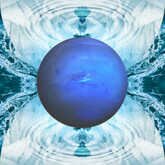 Neptune, the planet of dreams, is only partially comfortable in Aquarius. Neptune appreciates the global view of this sign, but prefers direct experience to Aquarian theories. The down side of this can be distorted group values and collective hallucinations. The collective neural network is losing its boundaries as Neptune connects all the synapses, all the time. Sensory overload, too much CNN, Internet and cell phones makes it hard to find a quiet place to just be by yourself. It's almost impossible to be alone, but all too easy to feel lonely. Where is the individual? It's harder to be yourself as social forces press up against you and seem to limit your choices of action. In fact, the Internet's a place where fantasies flourish as bald 50 year old men represent themselves as youthful studs. Who knows who you're talking to online? Step back from the shore and take a breath to remember who you are. Neptune of faith meets Aquarius of utopian idealism. A new religion of science and technology may emerge in the first decade of the new millennium. The problem is that spirit may get lost in the machine. We can become so full of concepts that we can’t find the feeling, the spiritual connection that makes us whole. Neptunian illusion in Aquarius may manifest as charismatic leaders of blindly devoted followers. Check your body, use your basic instincts to verify if what you're being told resonates within you. If it doesn't descend from the head, then it's not likely to lead to your liberation. Freedom is a key element of Aquarius, even though it's sometimes lost amidst the utopian dogma. Never give up you right to choose and understand that an ideal world of the future is one in which individual rights are fully respected, rather than sacrificed. Compassion (Neptune) for all of humanity (Aquarius) is a healthy expression of this symbolic pair. When you are able to love those who think differently than you, to accept many answers, rather than one holy truth, you are facilitating the healing of our planet. This, of course, is vital to your own personal healing and fulfillment. We are all in this together, even as we live life in our unique individual ways.